Features: 3 Modes: Red/Low/High; BatteryLock. The CXO 150 LED headlamp is applicable for various usages from camping to DIY to trekking & hiking. Duration Low: 60 hours. Duration High: 10 hours. Whether you’re at work or play, the waterproof Coleman® CHT 10 ultra bright headlamp allows you to get the job donehands-free. Up to 170-ft. (51.82 m) beam distance. Fully-adjustable soft head strap for comfort. Coleman BatteryLock™ technology and a simple twist of the head. Coleman® REAX™ - light sensor. To cyclethrough light modes and light intensities, the user simplywaves their hand within 7cm of the sensor on the front of the headlamp. The 250 model also features KineSix technology, allowing you to change the brightness without even touching the light. Reax sensor technology allows the head lamp to adjust automatically, based on the brightness of your surroundings, while KineSix technology allows you to adjust the brightness by swiping your hand in front of the torch - useful for when cycling or running. THERE IS A GREEN COLEMAN HEAD TORCH WITH 1.5" ADJUSTABLE BEAM. TWO HEAD TORCH LIGHTS THAT I BOUGHT FROM A HOUSE CLEARANCE SALE. AND THERE IS A 2 IN 1 HALOGEN HEADLIGHT WITH 2" ADJUSTABLE BEAM. AND TWO BULBS IN LENS FOR HIGH AND LOW BEAM . This headlamp is light, compact, user-friendly and stylish; ideal for a running session in the dark. Features BatteryGuard Technology. TheCHT 100 BatteryLock™ Headlamp is lightweight yet brightheadtorch ideal for a wide range of outdoor pursuits. Weighing just 90g including its battery, the CHT 100 BatteryLock Headlamplightweight construction makes it an ideal choice for walkers, campers and runners. 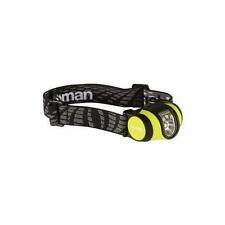 Coleman Battery Guard 300L Head Torch. Once the electric light has been switched off, you are sure to prevent battery loss. Not only does this protect your Coleman light, but also provides an extra level of safety for the user — the light is there when you need it. The new headlights CHT are equipped with a pivoting head that can be rotated to suit your preference for directional light. Battery Door: Belt-key used for quick battery changes. Weight: 63 g without battery, 85g with battery. The CHT 100 BatteryLock Headlamp is lightweight yet bright headtorch ideal for a wide range of outdoor pursuits. Weighing just 90g including its battery, the CHT 100 BatteryLock Headlamp lightweight construction makes it an ideal choice for walkers, campers and runners. REAX technology adjusts the head lamp's brightness automatically, while KineSix technology allows you to change the brightness without even touching the light. Reax sensor technology allows the head lamp to adjust automatically, based on the brightness of your surroundings, while KineSix technology allows you to adjust the brightness by swiping your hand in front of the torch - useful for when cycling or running. COLEMAN 2 WAY LED LANTERN. The lamp can be used for 360 ° lighting or as a flashlight for point lighting: just push the top down to put the lamp in the flashlight position. • Weight: 100g. The new headlights CHT are equipped with a pivoting head that can be rotated to suit your preference for directional light. • Battery Door: Belt-key used for quick battery changes. • Weight: 63 g without battery, 85g with battery. Pivoting Head and and adjustable head Band. Note: Color may vary from picture due to lighting effects. Front and back load balanced design. Color: Black/Pink, Black/Orange, Black/Red, Black/Blue. Keep your hands free, simply comfortable. Our CXO 150 head torch is well suited to many uses from camping and trekking to helping with DIY tasks around the home. Featuring BatteryLock™ technology ensuring your batteries won’t be drained during periods of non-use. With bright lighting output and 3 x AAA Duracell® batteries included with a CXO 150 you’ll never be left in the dark wherever you find yourself. ---Light output: 200/20 lumens (high/low) ---Beam distance: 40/5 meters (high/low) ---Runtime: 5/40 hours (high/low) ---Lighting modes: Low/ High and Red light ---Batteries: 3 x AAA Duracell® included ---Features: BatteryLock™ ---IPX level: IPX4 - Splash resistant ---Size: 6.8cm x 3.0cm x 4.0cm ---Headband: 60cmØ ---Weight: 110g with battery. A rugged bit of outdoor gear, Coleman's CXO 250 LED Head Torch is the basic head torch from Coleman. Light weight of 110g and small size make the head torch light and comfortable - this also benefits from a comfort tension headband system. The CHT 80 Battery LockHeadlamp is a super-lightweight headtorch that weighs just 74g including its battery. The CHT 80 BatteryLock Headlamp has an IPX4 weatherproof construction. Benedict Court. Weight: 41 g (with battery). The Cxs 300 Is Also Equipped With Coleman Battery Lock Technology, Stopping Battery Drain And Extending The Life Of Your Batteries. Coleman Battery Lock Technology Ensures Your Batteries Are Ready When You Are. Featuring BatteryLock technology ensuring your batteries won’t be drained during periods of non-use. With bright lighting output and 3 x AAA Duracell batteries included with a CXO 200 you’ll never be left in the dark wherever you find yourself. This headlamp is also water and impact resistant for robust use. Bulb type 1 Cree LEDand 2 SMD LED 10W. Water resistant. The Highlands and Islands of Scotland, Northern Ireland, other islands etc. 4 brightness settings. Features: BatteryLock, REAX Auto Adjust. This auto-adjusting CXS 200 LED head torch features 5 different lighting modes. Equipped with an advanced REAX sensor, this practical headlamp also benefits from a comfort tension headband system. Our CXO 200 head torch is well suited to many uses from camping and trekking to helping with DIY tasks around the home. Featuring BatteryLock™ technology ensuring your batteries won’t be drained during periods of non-use. With bright lighting output and 3 x AAA Duracell® batteries included with a CXO 200 you’ll never be left in the dark wherever you find yourself. --- Light output: 200/20 lumens (high/low) --- Beam distance: 40/5 meters (high/low) ---Runtime: 4/40 hours (high/low) ---Lighting modes: Low/Medium/High and Red light ---Batteries: 3 x AAA Duracell® included ---Features: BatteryLock™ ---IPX level: IPX4 - Splash resistant ---Size: 6.8cm x 3.0cm x 4.0cm ---Headband: 60cmØ ---Weight: 110g with battery. Our advanced REAX sensor automatically adjusts the headlamp’s beam to suit your surroundings. For hands-free operation, the Coleman® CXS 250 also features KineSix technology, enabling you to turn the headlamp on, off or change modes with the wave of a hand. SUMMIT PROLITE 30 HEAD TORCH. Summit ProLite 30 contains 3 ultra bright white LEDs. This ultra lightweight and compact design features an adjustable head strap and an 8 hour battery life. • Ultra lightweight head torch. Coleman CHT 80 Battery Lock Torch Lamp Headtorch Lightweight IPX4 - Blue. CHT 80 Battery Lock Head Torch. - Battery Lock technology. - Battery life 10hours - 60hours. - Beam distance 10m - 40m. Studio: Coleman. Orders will be fulfilled by our own warehouse or a 3rd party supplier at our discretion. Colour: Black. Model: 2000026401. We promise to do everything possible to put things right for you. Our CXO 250 head torch is well suited to many uses from camping and trekking to helping with DIY tasks around the home. Featuring BatteryLock™ technology ensuring your batteries won’t be drained during periods of non-use. With extremely bright lighting output and 3 x AAA Duracell® batteries included with a CXO 250 you’ll never be left in the dark wherever you find yourself. ---Light output: 250/20 lumens (high/low) ---Beam distance: 50/5 meters (high/low) ---Runtime: 3/40 hours (high/low) ---Lighting modes: Low/Medium/High and Red/Blue/Green light ---Batteries: 3 x AAA Duracell® included ---Features: BatteryLock™ ---IPX level: IPX4 - Splash resistant ---Size: 6.8cm x 3.0cm x 4.0cm ---Headband: 60cmØ ---Weight: 110g with battery. A rugged bit of outdoor gear, Coleman's CXS 200 LED Head Torch is lightweight and portable. Light weight of 114g and small size make the head torch light and comfortable - this also benefits from a comfort tension headband system. Bright headlamp with axis positioning pivot head with easy access button. England,Wales and lowlands of Scotland ONLY. UK Mainland. This auto-adjusting CXS 200 LED head torch features 5 different lighting modes. Equipped with an advanced REAX™ sensor, this practical headlamp also benefits from a comfort tension headband system. Designed with light sensing technology, the CXS 200 headlamp automatically adapt its beam pattern to the surrounding environment and needs of the wearer. The advanced headlamp also feature Coleman BatteryLock™ technology meaning it is ready to go whenever you are. ---Light output: 200/20 lumens (high/low) ---Beam distance: 30/5 meters (high/low) ---Runtime: 5/50 hours (high/low) ---Lighting modes: Low/Medium/High/Extra Bright ---Batteries: 3 x AAA Duracell® included ---Features: BatteryLock™, REAX™ ---IPX level: IPX4 - Splash resistant ---Size: 6.8cm x 3.0cm x 4. Coleman CHT10 Headlamp. Hold the power button for 10 seconds and the light will shut off. IPX7 waterproof up to 30 minutes in 3ft water. Push button power. Strap key for quick battery change. Easy open battery door. 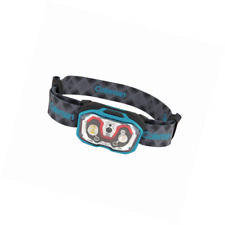 Coleman Water Resistant CXP+ 300 Outdoor Headlamp Blue . If you're looking for some new gear for an outdoor holiday, a Coleman camping and hiking head torch is the perfect addition. There are lots of head torches to choose from that vary in model, however they all have the essential features that make these head torches work so well. Enjoy your hiking, camping or fishing even when it starts to get dark by having plenty of light and your hands free at the same time. Ensure that your tent or campsite is lit with smart technology. Coleman's camping head torches have been designed with amazing light sensing technology. This technology controls the headlamps to adapt their beam pattern and light brightness to the surrounding environment or to the conditions that the user wants. Coleman head torches feature a minimum of 5 light settings allowing you to use and wear the head torch in all light conditions, from dusk to the middle of night. They also feature red and blue light modes. Another feature that the Coleman head torches offer is battery lock technology, which helps you retain your battery life until it is needed. Normal batteries lose power very quickly as they drain the life out of the electronic product you are using. However, with this head torch from Coleman , battery lock technology is used which makes sure the battery isn't being drained when the torch isn't in use. When you want to use the lamp, a simple move of the head enables it. You will never need to worry about being left in the dark woods when camping again as you will be able to trust this headlamp to last your whole trip. From all of the Coleman camping head torches available, there are a variety of models and styles that differ in the features, from an LED model to a rechargeable one. It is important that you choose the right model to suit your needs. All head torches offer the basic features that include light sensing technology, a strong light, battery lock system and an adjustable headband to enable a comfortable fit for all head sizes.